What are you doing New Years Eve? You can go to a Tango lesson, an opera, visit a French restaurant, an Afrikaans Music evening, a male choir performance or sip a cognac at a bar. Or – you can come to Brooklyn Theatre and experience all the above on one single stage. And we will treat you on arrival with a Brooklyn Bellini – Rocco’s custom designed cocktail for the Brooklyn Theatre. Popular pianist Rocco de Villiers performs at Brooklyn Theatre for the first time. 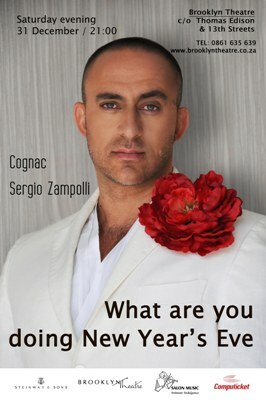 He is joined by accordion master, Sergio Zampolli and Cognac, a new group of exciting male singers. They will entertain with tango’s by Gardel, Piazzola, de Villiers and renditions of well-known opera arias from Samson & Delilah, The Pearlfishers and The Marriage of Figaro. Add to that quirky interpretations of well-known Afrikaans folksongs like Daar kom die Alibama and Sarie Marais and your New Years’s Eve is perfectly tailormade. Well-dressed, well brought-up, well-spoken and of course well-rehearsed these seven musical men will make music from 22h00 till midnight. What are you doing for New Year’s Eve? By now you should know!